A bike rack in Atikokan, Ontario. Because the town is considered the "Canoeing Capital of Canada", many canoe symbols are seen around town. 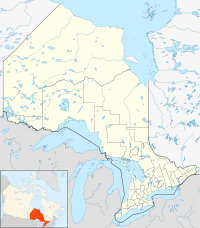 Atikokan (Ojibwe for "caribou bones") is a township in the Rainy River District in Northwestern Ontario, Canada. The population was 2,753 as of the 2016 census. The town is one of the main entry points into Quetico Provincial Park and promotes itself as the "Canoeing Capital of Canada". Atikokan was originally established as a rail stop for the Canadian Northern Railway. The town of Atikokan is an enclave within the Unorganized Rainy River District. It is located west of the Central Time Zone longitude border but observes Eastern Standard Time for the whole year. The original settlers to the Atikokan area were the "Oschekamega Wenenewak" (The people of the cross ridges) Ojibwa / Chippewa. They lived by themselves until the arrival of Jacques de Noyon in 1688. His journey was critical for the expansion and exploration of the Atikokan area. Palliser Gladman-Hind suggested the first real road in the area, he intended for it to go as far as possible starting from Arrow Lake, and after the road's end travellers would take a waterway to Fort Frances. Simon Dawson, on the other hand, thought the road could go from Dog Lake, to Thunder Bay, then using a series of dams, would allow even the larger boats to travel along the route of Dog River, Savanne River, Lac des Mille Lacs, via Pickerel Lake and Sturgeon Lake. The government, ignoring both plans, decided to build a road west of Lac des Mille Lacs, down the Seine River and finally into Rainy Lake. In 1859, Simon James Dawson was hired to begin the route, but the plan was held up due to poor economic conditions in the east. In 1867, after Confederation, there became an increased need for communication to the west. Construction of the Dawson Trail began in Prince Arthur's Landing in 1868. Construction was sped up in 1869 as the Riel Rebellion resulted in the need to transport troops. In 1937, when Julian Cross discovered ore, it seemed like Atikokan had some potential for becoming a real town. The first real showing was the construction of the Canadian Imperial Bank of Commerce on Clark Street. Pitt Construction arrived later to construct roads. Their new way of making roads with machines amazed old-timers, who were used to making them using a pick, shovel and wheelbarrow. In 1950, the population had grown to 3,000 people. The first businesses in Atikokan could buy lots on Main Street for only $10 an acre, but the prices soon skyrocketed to $100 per square foot. Even with the high costs, stores, restaurants, banks and other establishments sprang up very quickly. The second bank to open was the Toronto-Dominion, the third, the Royal Bank of Canada. During the fur trade era, major fur transportation and trading routes used by the voyageurs passed through the waters and portages south of what would later be Atikokan. The potential for the Steep Rock iron mine was revealed in 1897 by a non-resident geologist named William McInnis. Nothing was done until the winter of 1929–1930, when Julian Cross started interviewing iron and steel companies to try to unlock Steep Rock's potential. He finally convinced a company from Duluth, Minnesota, led by Robert Whiteside to take the job. In 1932, Dr. McKenzie and Tom Rawn staked out the entire South East bay of Steep Rock. They then found a spot, sunk a shaft and found it was rich with high grade hematite. The mine was quickly abandoned as they had trouble keeping water out of it. In 1940, Rawn sold 109 claims located west of Steep Rock to Midwest Iron Mining Corporation, and in March of that year, with 60 claims in his name, created Rawn Iron Mines Ltd. Four months later, on July 23, Rawn went out prospecting near Sapawe, and never returned. Parties searched for weeks, but his remains were never found. An aboriginal person discovered The Hammond Reef Mine in 1894 on the shore of Sawbill Lake, about 30 miles from Atikokan and showed it to John Hammond. A 10 stamp mill was built there in 1897 and 30 more stamps were added along with a hydro electric power house. It later closed down in 1899 because the results were disappointing. It then reopened in 1938. Timber was first noticed in the area as early as the 1870s. There were 31 surveys, with 21 being in Quetico Provincial Park and 10 being in the Clearwater and White Otter Castle area. The first attempt at harvesting timber in the area was in the 1886. A sawmill was located on the height of land east of the French Portage. Before the 2nd World War, mineral exploration in the area determined the presence of a large, high grade, iron ore deposit at the bottom of Steep Rock Lake. After the war a large water diversion project on the Seine River system was undertaken to enable the draining and dredging of Steep Rock lake in order to develop open-pit mining operations. In 1994, a 10 megawatt hydroelectric generating station (Valerie Falls Power) was developed on the Seine River diversion that had facilitated the opening of the mines 40 years earlier. From 2012 until 2014, the Atikokan Generating Station was converted from a coal-fueled to a hundred percent biomass-fueled plant. On February 1, 2013, Resolute Forest Products announced its plans to develop a new single-line random-length sawmill located in the Atikokan area, to be operational in 2014. The plan would create 90 direct jobs in Atikokan, with the additional benefit of supplying residual forest products to nearby pulp and paper mills. Atikokan has a humid continental climate (Köppen Dfb) with four distinct seasons. Winters are long, cold and snowy while summers are warm. Precipitation is higher during the summer months and lower during the winter months. The highest temperature ever recorded in Atikokan was 42.2 °C (108 °F) on July 11 & 12, 1936. This is the highest temperature ever recorded in the province of Ontario. Atikokan shares this record with Fort Frances. The coldest temperature ever recorded was −48.9 °C (−56 °F) on 19 January 1943 and 15 February 1939. Atikokan's main employers are the Atikokan Generating Station located 20 kilometres north of the community, the general hospital, Quetico Provincial Park and (collectively) its canoeing outfitters. Ontario Power Generation (OPG) has been one of Atikokan's main employers since the early 1980s. Constructed as a fossil-fuel burning facility, the Atikokan Generating Station burned coal shipped from Saskatchewan until 2012. It was then converted to a biomass plant, re-opening in 2014. Formerly, Fibretech, a fibre board processing plant in Atikokan closed, but was converted by Rentech Inc. to produce wood pellets to supply the newly converted biomass generating station. The Sapawe lumber mill located approximately 30 km from Atikokan reopened under management of Resolute Forest Products. The mill employs 108 workers. The Osisko Mining Corporation is planning a new gold mine and ore processing facility at its Hammond Reef site approximately 30 kilometers north of Atikokan. The company plans to have a permit by 2013, open in 2016 and operate until 2030 followed by a 2-year decommissioning and closure process. The mine is planned to have two main open pits to produce 17.5 million tons of gold ore each year. The town is located off Highway 11, between Thunder Bay and Fort Frances. A CN Rail branch line runs along the south side of town. When Atikokan opened its first rail line, fares were $15. Atikokan Municipal Airport is located to the northwest of the town. Little Falls, a scenic water body within the town limits. Atikokan was selected as the host site for the 2003 edition of 'Raid the North Extreme', a televised 6 day multi-sport expedition race that visits wilderness locations across Canada. A key factor in the selection was the proximity to Quetico Provincial Park. Quetico Park, located about 20 minutes south from the town of Atikokan, is a protected park with a route of lakes that was once traveled by the voyageurs. The Town of Atikokan has a full-sized arena and swimming pool. Fitness facilities exist at the Atikokan Native Friendship Centre (ANFC) and Ironworks Gym. The clubs and activities in Atikokan include: Atikokan Minor Hockey Association, Atikokan Figure Skating Club, Little Falls Golf Club, Little Falls Curling Club, Beaten Path Nordic Trails, Mount Fairweather Alpine Skiing, Atikokan Sno-Ho Snowmobiling Club, Atikokan Bowling Association, Atikokan Public Library programs, Atikokan Native Friendship Centre (ANFC) and Quetico Provincial Park's Natural Heritage Education outreach programs. Annual events included the Atikokan Bass Classic, a smallmouth bass tournament for teams of all kinds, Poker Run and Annual Sno-Ho Rally with the Atikokan Sno-Ho Snowmobiling Club  and the Atikokan Mud Slingers 4x4 Races, a summer event located at Charleson Recreation Centre. Partial view of Atikokan as seen from above. Atikokan is served by one elementary school, one separate school and one high school. Public Schools are administered by the Rainy River District School Board, St. Patrick's School is administered by the Northwest Catholic District School Board. The Atikokan Public Library started on December 16, 1952 with only 700 books. Currently it has a varied collection of 30,000 items such as books, CDs, DVDs, and e-books, and offers public computers and computer instruction. The Atikokan Centennial Museum has a collection of heavy equipment from early logging, mining and railroad days. The Atikokan Entertainment Series offers six or more high quality performances per season. Quetico Provincial Park's Artist in Residence Program offers workshops, demonstrations and opportunities to artists from around the world to immerse themselves in the beauty of the area. The Pictograph Gallery is a volunteer-run gallery that features arts and crafts of local and regional artists. The mayor Dennis Brown leads the municipal government in Atikokan along with 6 councillors, Liz Shine, Samantha Boyko, Rob Ferguson, Harold Mosley, Mary Makarenko, and Marj Lambkin. The Atikokan General Hospital is a 41-bed hospital. Serving about 6,000 patients a year, this hospital offers emergency care, long term care, and rehabilitation services. ^ "Atikokan, Ontario (Code 0028) and Ontario (Code 35) (table). Census Profile". 2011 Census. Statistics Canada. Retrieved 2012-03-30. ^ "Canadian Climate Normals 1971-2000". Atikokan, Ontario: Environment Canada. Retrieved 2012-03-19. ^ "Atikokan, Ontario (Code 0028) and Ontario (Code 35) (table). Census Profile". 2016 Census. Statistics Canada. Retrieved 2017-02-08. ^ "It's about TIME". Archived from the original on 2008-05-01. Retrieved 2008-04-03. ^ a b c d e f g Vita, Alan (1974). A History of Atikokan, 75th Anniversary Booklet Committee. ^ a b Fur Trade Canoe Routes of Canada/ Then and Now by Eric W. Morse Canada National and Historic Parks Branch, first printing 1969. ^ "Valerie Falls Dam". Seine River Watershed. Retrieved 2010-08-07. ^ "Atikokan Biomass Conversion". Ontario Power Generation. Retrieved December 11, 2018. ^ "Resolute to build sawmill in Atikokan". Archived from the original on 2013-02-15. Retrieved 2013-02-03. ^ "Climatic Regions [Köppen]". Atlas of Canada. Natural Resources Canada. June 2003. Archived from the original on 2012-04-03. Retrieved 2013-02-03. ^ "Daily Data Report for July 1936". Canadian Climate Data (in English and French). Environment Canada. Retrieved 28 October 2016. ^ "Daily Data Report for January 1943". Canadian Climate Data (in English and French). Environment Canada. Retrieved 28 October 2016. ^ "Daily Data Report for February 1939". Canadian Climate Data (in English and French). Environment Canada. Retrieved 28 October 2016. ^ "Atikokan, Ontario". Canadian Climate Normals 1971–2000 (in English and French). Environment Canada. Retrieved 28 October 2016. ^ "Atikokan CLI". Canadian Climate Data (in English and French). Environment Canada. Retrieved 28 October 2016. ^ "Atikokan (AUT)". Canadian Climate Data (in English and French). Environment Canada. Retrieved 28 October 2016. ^ a b "2011 Community Profiles". 2011 Canadian Census. Statistics Canada. July 5, 2013. Retrieved 2012-03-30. ^ a b "2006 Community Profiles". 2006 Canadian Census. Statistics Canada. March 30, 2011. Retrieved 2012-03-30. ^ a b "2001 Community Profiles". 2001 Canadian Census. Statistics Canada. February 17, 2012. ^ "Ontario Power Generation". Archived from the original on 2012-01-22. Retrieved 2011-11-29. ^ "Phasing Out Coal Power in Ontario". Ministry of Energy, Northern Development and Mines, Government of Ontario. Retrieved December 11, 2018. ^ "Wood Pellets". Rentech, Inc.
^ "Atikokan". Resolute Forest Products. Retrieved December 11, 2018. ^ "Atikokan Native Friendship Centre". ^ "Tourism Atikokan". Atikokan Economic Development Corporation. Retrieved December 11, 2018. ^ "Atikokan Bass Classic". Archived from the original on 2012-03-02. Retrieved 2012-03-23. ^ "Atikokan Sno-Ho Snowmobile Club". ^ "Atikokan MudSlingers". Archived from the original on 2012-03-02. Retrieved 2012-03-24. ^ "Centennial Museum". Archived from the original on 2011-12-31. Retrieved 2012-01-12. ^ "Pictograph Gallery". Archived from the original on 2012-01-22. Retrieved 2012-01-12. ^ "Mayor & Council". Retrieved December 11, 2018. Wikimedia Commons has media related to Atikokan.